The purpose of this assignment was to create an interface that was inspired by your partner, where the main interaction is a button. Clicking on the button would display part of the partner’s personality. For my project, I was given awesome Aaron as a partner. I asked him basic questions to understand him better. Questions such as, does he like animals, what are his hobbies, what does he value most in life, if his friends could describe him in one word what would it be, etc. 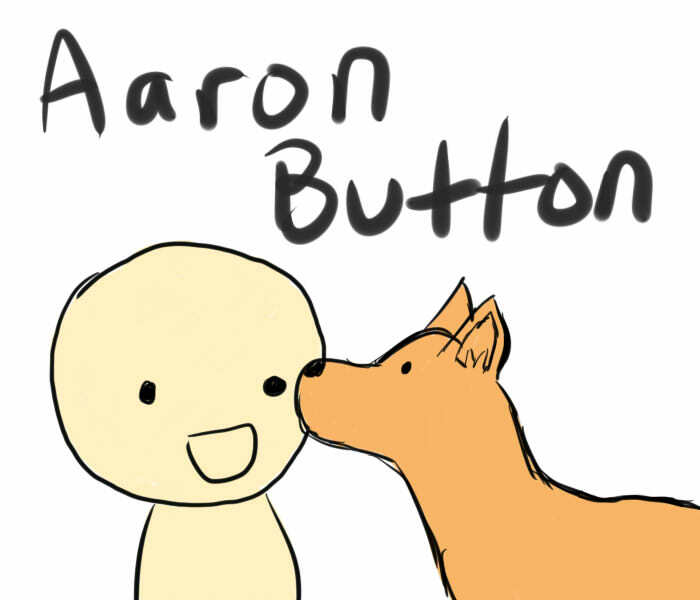 From that I gathered that Aaron was an avid dog lover, video game fanatic, and a person who tries to stay in bed for the longest time possible. I also learnt that his favourite colour was red and other interesting information about him. 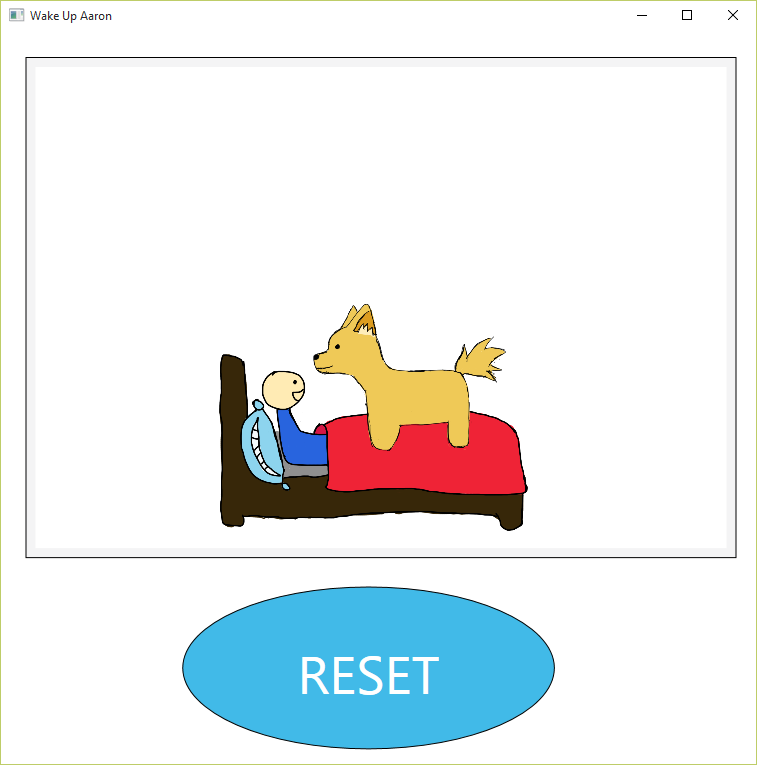 Using all the information I gathered, I decided to create a button that tried to revolve around three themes, Aaron’s sleeping habits, his love for dogs, and video games. Design C – another design to capture Aaron’s sleeping habits. Clicking on him would attempt to wake him up, but he would refuse to wake up and continue sleeping until you bothered him again with another mouse click. 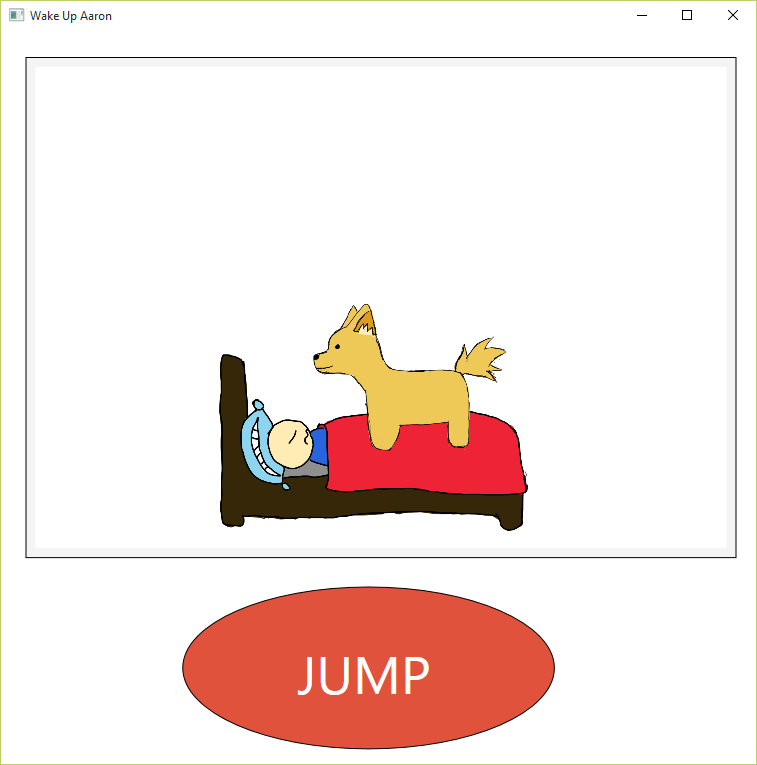 Design D – Combined both ideas from Design B and Design C. Clicking on the controller causes the dog to jump and attempt to wake up Aaron. 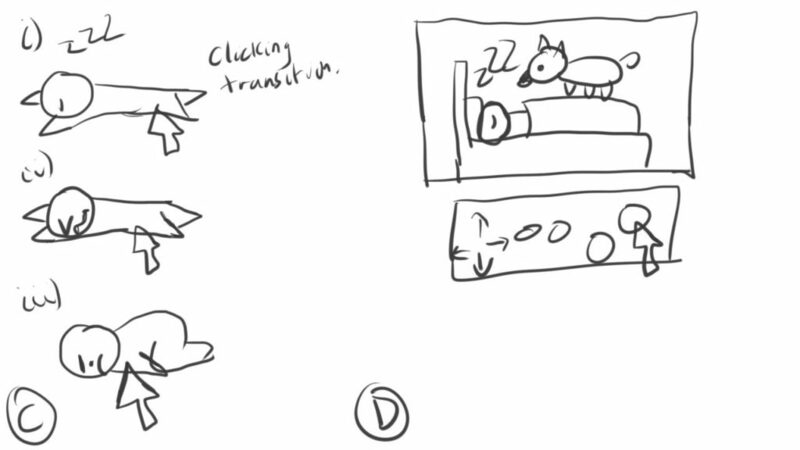 Design A was a video game controller that would play a sound or animation when you clicked on the correct button. 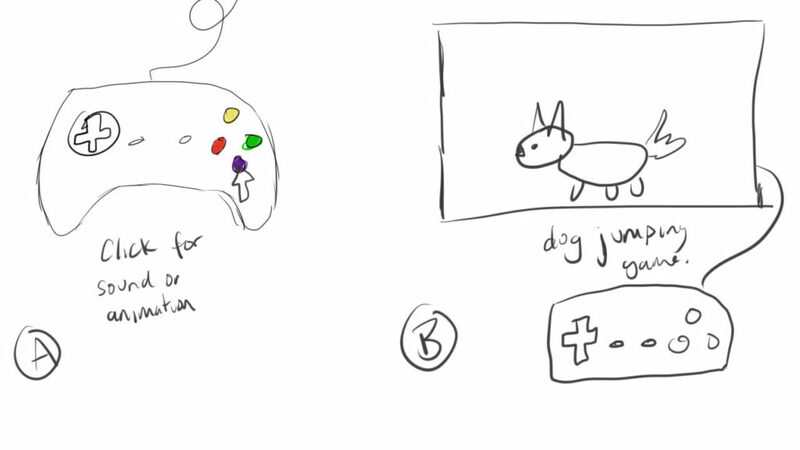 Design B – an iteration of Design A, I added a screen and a dog. 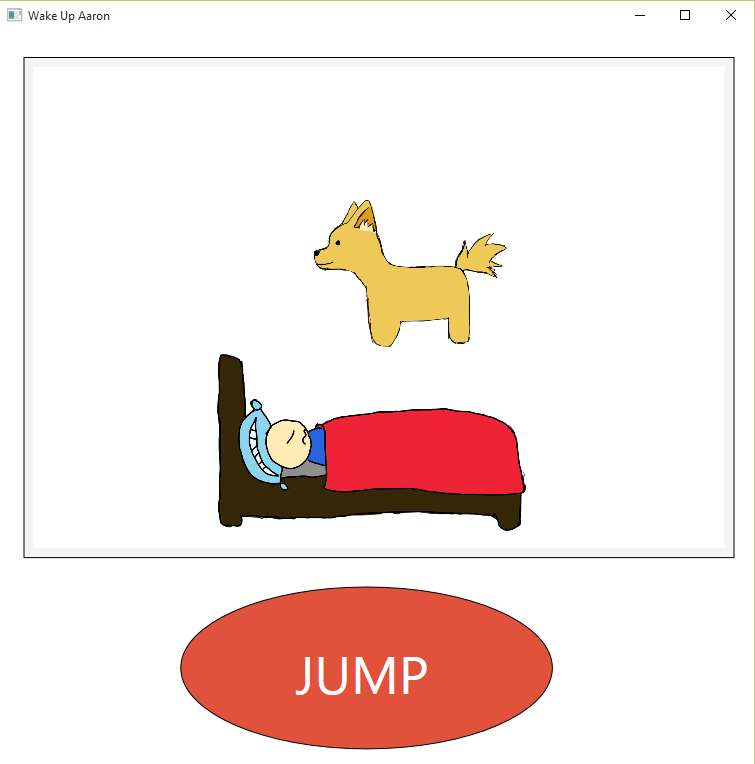 Clicking on a button would allow the dog to jump. Design D was the design that I decided to work with. With some critique from my peers I decided to have a single button instead of a controller. It made the design more simple and easy to understand which button to click. This is the start screen of the game. Aaron is currently sleeping. This is what the dog looks like when he jumps. It’s just a simple animation. Success! Aaron is awake and his dog can finally have some attention! Hitting restart again will put Aaron back to sleep. After some jumps from the dog, Aaron will begin to stir in his sleep. One more jump should be able to wake him up.